For Christmas, my best friend bought me a wonderful pizza stone and peel that I'd been eyeing up for a while. For so many years, I eschewed the pizza stone because of lack of storage space. And, also because I tend to like tools and equipment that I use very frequently rather than silly or single use tools. Let's just say, I'm really thrilled that she bought me the stone and peel and even though I won't use it every week, the results are so spectacular that it's absolutely worth the extra space and storage creativity I need because of it. I wrote a post over on one of the other blogs I write for, The Cook's Kitchen, and there you can read all about the stone itself and how much it's seduced me. In a word, the difference? Crust. It's crispy, fully baked and delectable. I didn't make the pizza dough myself this time around, I must confess I was feeling lazy and getting too many weekend chores done to spend the whole afternoon in the kitchen. So, I walked around the corner to the local pizza shop, we have one on every corner in New York, and bought the dough from one of the cheery neighborhood pie makers. 1. Place the pizza stone on the middle rack of the oven while the oven is cold and then turn on the oven to preheat to 500˚F. 2. 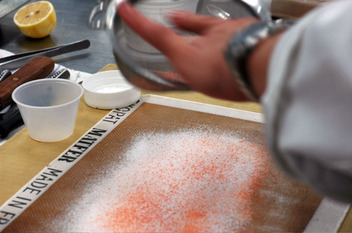 Roll out the dough on a flat countertop space using a little extra flour and heavy rolling pin. Make sure to get the dough even. Dust your peel with a little cornmeal and place the dough on top of the peel. Crimp the edges of the pizza upward to try and contain some of the sauce and toppings. 3. Layer your toppings as desired, in our case we used tomato sauce on the whole pizza, then a handful of mozzarella cheese. 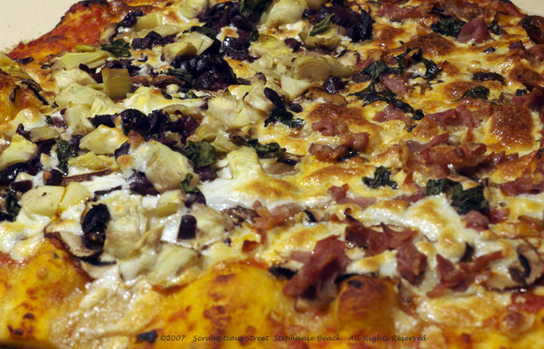 Then, we layered the veggie side with mushrooms, olives, artichoke hearts and more cheese and the meat side with mushrooms, prosciutto and more cheese. Sprinkle the top with fresh basil. 4. When oven is fully preheated, open the door and slide the pizza onto the stone by sliding the peel forward to cover the stone and then quickly jerking the peel backward toward your body, leaving the pizza on the stone. If it doesn't fit properly, try to adjust the pizza to be centered on the stone. 5. Close the oven door and let the pizza bake about 20-25 minutes or until the pizza is bubbling and the crust is a light golden brown. The last 10 minutes, reduce the oven temperature to 475˚F. 6. Lay out a cooling rack on the countertop and remove the stone with the pizza on top and place on top of the cooling rack. I chose to leave the pizza on the stone so that second and third serving pieces were still hot. If you do this, however, you should not use a pizza cutter directly on the stone. 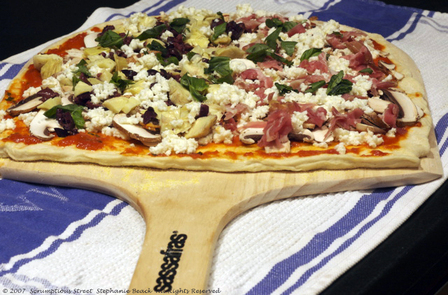 Instead, use a pair of sharp kitchen shears to cut the pieces after the pizza has cooled slightly. If you want to use a pizza cutter to make uniform slices, then use the peel to slide under the pizza and remove it from the oven, placing on a cutting board. Make sure to let the stone cool gradually at room temperature. 7. Cut, serve and enjoy this delicate and crispy yet airy crust! The only thing about the pizza stone that isn't optimal is that it's nearly impossible to keep it 100% clean. Even from the first use, it's normal for the stone to get stained. Clean it with water and a scouring pad and a little baking soda, to remove all the food itself. But, it's pretty certain you'll not get any tomato or cheesy oil stains out of the stone completely. That's okay, it's worth it! I like a little brightness and punch in my food during the cold winter months and one of the ways I do this when baking is to use dried variations of my favorite fresh fruits and produce. When they aren’t available fresh, the dried variation will give the flavor and zip I’m seeking. 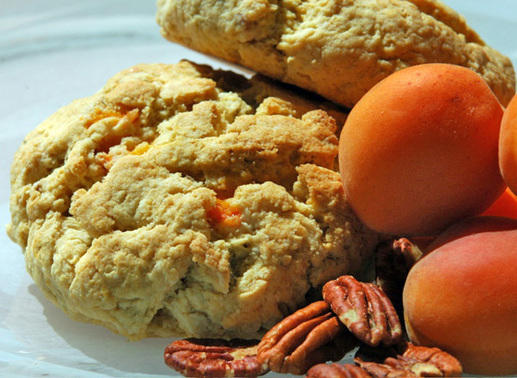 Craving the taste of mangos, my very favorite fruit, I created scones this weekend with just enough flavor and brightness to satisfy the craving. Here are my “Mango and Candied Ginger Scones”. 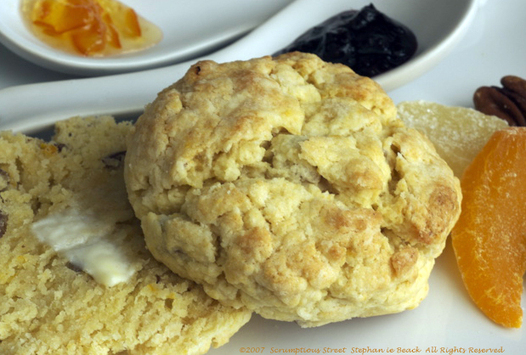 The basic scone recipe is a variation on the recipes in Once Upon a Tart. 1. Position your oven racks so that one is in the center and preheat oven to 400˚F. Line a baking sheet with parchment paper. 2. Put the dry ingredients into the bowl of a food processor, fitted with the metal chopping blade and pulse to mix. 3. Add the butter all at once to the processor and run for about 10 seconds in “on”. Then, switch to “pulse” and process in bursts until there are no more chunks of butter and the ingredients look like moist bread crumbs. 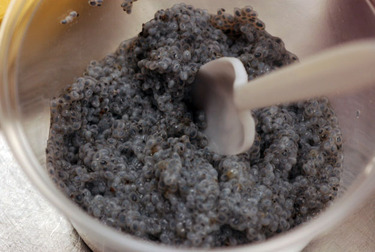 Stop immediately and dump the mixture into a large bowl. 4. In a small bowl, whisk the eggs to break up the yolks, whisk in all the other ingredients and incorporate completely. 5. Pour the wet ingredients on top of the dry mixture and quickly stir with a wooden spoon until the flour is fully worked in. Stop there, do not overwork the dough. 6. 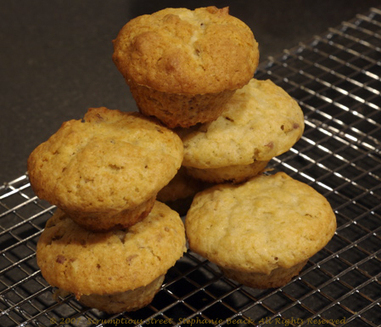 Use a ½ c. measuring cup or your hand to scoop out the batter and set onto the baking sheet. Leave about 2 inches between the scones. 7. Bake the scones in the center of the oven for about 20-25 minutes, until the tops are golden brown and a toothpick comes out clean when inserted into the scone. 8. Remove the scones from the oven and place the baking sheet on a cooling rack for a few minutes. Then, life the sheet off the rack and transfer the scones directly to the cooling rack. 9. 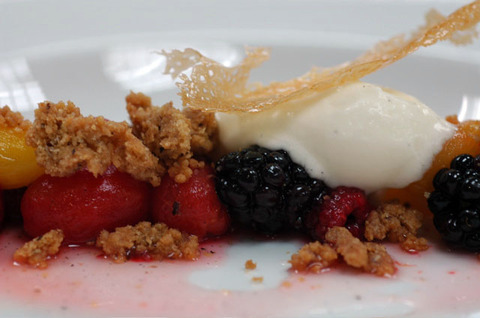 Serve when cooled slightly, otherwise they’ll crumble apart too much. Choose whichever condiments you like, with this recipe we used butter, and orange marmalade or my favorite Wild Blueberry-Ginger jam. They were excellent choices, the Clementine juice and zest played off the orange marmalade or the ginger pulled out the ginger in the blueberry jam. These are hearty and deliciously bright scones for a wintry day. My darling husband, Mr. Scrumptious, had a birthday yesterday!! We were so busy celebrating I didn't get to let you all know about it until a day late. My husband is the most wonderful, kind, gentle and brilliant person I have ever met. We have an extremely deep and powerful bond which makes us much more than husband and wife. Each and every day I am so very grateful, thrilled and profoundly awestruck that I am married to the greatest person I have ever known. I love and cherish him with my entire being and our three years of marriage have been the best years of my life. Every day is better than the one before. His birthday is a special day to shower him with all the love and spoiling I can muster. 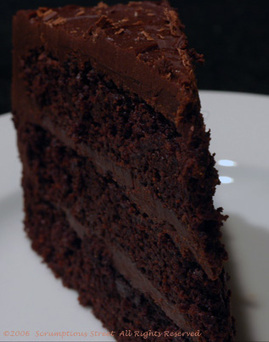 Last year before our Christmas party, I discovered a decadent and very rich recipe from Food & Wine magazine for a Fudgy Chocolate Cake by Andrew Shotts. 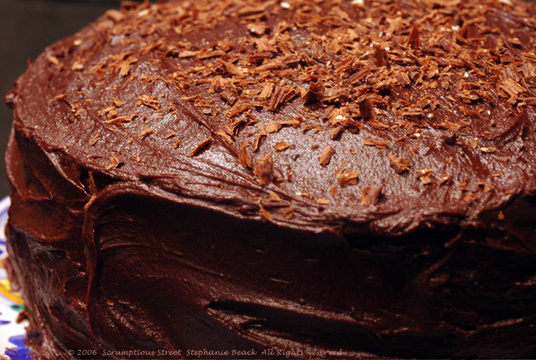 This three-layer beauty is unique, dreamy, intense and scrumptious. Just like my husband. So this year, I made this luscious cake to match him, my darling Mr. Scrumptious. Happy Birthday, my love. P.S. I used Jacques Torres 70% bittersweet chocolate. Wow. Typically, if there is a best-seller, a blockbuster movie or a pop-culture trend I am either an early adopter or I am suspicious of the wave of mass-culture and stay far away. This is also true in the kitchen, where I really enjoy doing my own thing and making things up. For the first time in my cooking and baking life, the buzz about a certain dish or technique is so loud, that I simply had to try it myself. 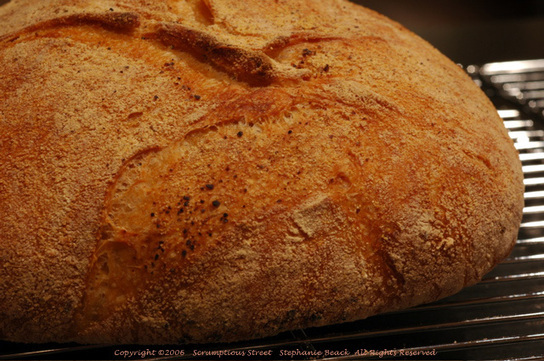 This "No-Knead Bread" by Jim Lahey of Sullivan Street Bakery and covered by Mark Bittman in a recent New York Times article has taken the foodie world by storm. At first I was indifferent, then curious and finally intrigued. One of the reasons I very rarely make bread is the labor-intensive and manual nature of the proper kneading function. WELL, NO MORE!! This bread is as astounding and delicious as promised and far exceeds the expectations I had from all the hype around it. Quite simply, it's professional quality bread and even though it's time-intensive, it really couldn't be simpler. You can find the recipe here, make sure to also watch the video first as it helps to answer some questions in advance. The video doesn't show exactly how the surface of the dough should look when it's sufficiently "bubbled" so I took a photo for you all. This was mine at 19 hours and I let it go about 30 minutes more. 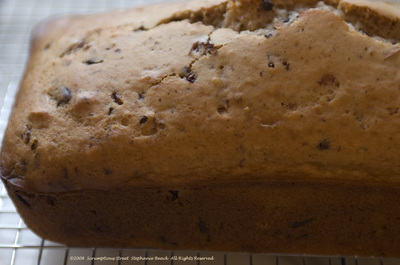 The recipe recommends all-purpose flour or bread flour. My choice was King Arthur European Style Artisanal Bread Flour and if you can find it, I recommend it. When I mixed the dry ingredients, I used my hands and was delighted by the soft and velvety texture of the King Arthur's bread flour. After the bread mixture sat in my apartment for 20 hours, I took it out, floured a surface and folded it over in thirds twice. Truly, it will amaze you that you do not knead this bread at all. Just folding it over four times does the trick. Here's how it looked after folding and before the final 2 hours of proofing. In order to make this bread, you need a heavy cast iron or a large ceramic pot with lid. I had a casserole which may have worked but used the bread as an excuse to buy another pot I've been wanting for a while. This pot helped make the bread so crusty and gorgeously brown, I really think the cast iron or enameled cast iron makes a difference. I made this on a weekend and took it to a friend's home for dinner on a Sunday evening. I had to shoot the photos before we left, therefore unfortunately you don't get to see inside after we sliced it. The crust is crisp and crunchy, but the inside was so light, fluffy, chewy and aerated. It had wonderful holes and its soft and melting puffiness worked very well with the fisherman's soup my friend served. 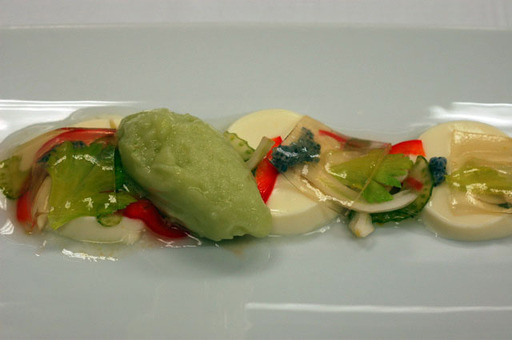 I also prepared some tarragon butter which perfectly matched the flavor of the soup and intensified the bread's flavor. This bread will be our new staple at Scrumptious Street, I'll make it over and over. The entire apartment smelled so good and reminded me of my mother's homemade loaves when I was a child. The result was perfect and far better than anything bought at a bakery or in a plastic bag. 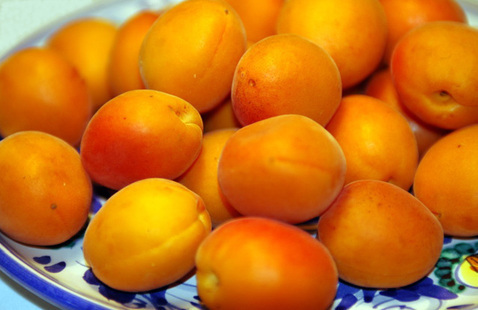 The apricots I bought last week at the Union Square Farmers market were so succulent they inspired me to hunt for a recipe worthy of them. I found it, in the delightful cookbook from the chefs and owners of Once Upon a Tart, a fantastic pastry shop and cafe in New York. The owners/chefs/authors Frank Mentasana and Jerome Audureau have compiled a delectable collection of some of their classics from the shop into Once Upon a Tart...Soups, Salads, Muffins and More. This book is incredible, with phenomenal recipes, so rather than give this one for Dried Apricot Scones with Pecans and Shredded Coconut to you free on this blog I am going to suggest you just buy the cookbook. It should be on every cook's shelf. 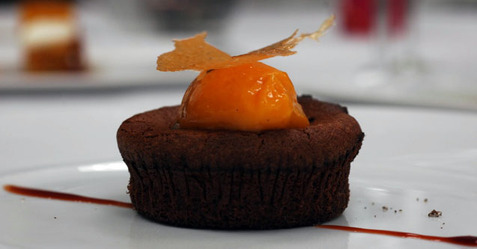 The only significant change I made to the recipe was to use fresh apricots rather than dried. In my opinion, it only made them better by having a juicy morsel in every bite. See how gorgeous my apricots were, straight home from the market. I suppose making these scones with the fresh ones have tainted this recipe for me forever-- only fresh will do. But there are so many other recipes in the book to try, I will stay busy until apricots are fully in season again anyway. While making the scones, at one point you whisk the apricots, pecans and coconut into wet ingredients. 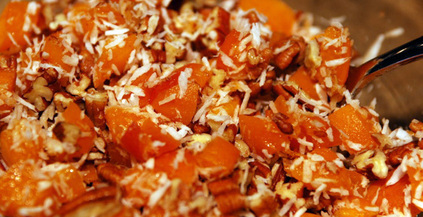 While I was preparing for that step, I chopped the apricots and pecans and put them in a small bowl and then added the coconut. It looked so lovely, I thought I should share this photo with you too. I thought these scones would be too sweet or rich, but they are not. They're exquisite and completely scrumptious. 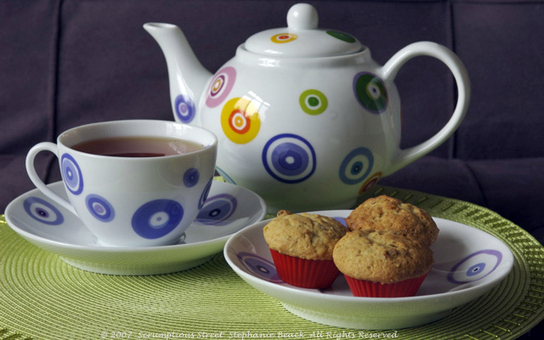 We had them in the late morning, with a freshly brewed pot of Early Grey and chamomile tea. My husband and I like mixing our teas to come up with interesting combinations. We each had one scone and split a third. We didn't eat again until 9:00 that evening and weren't even hungry. 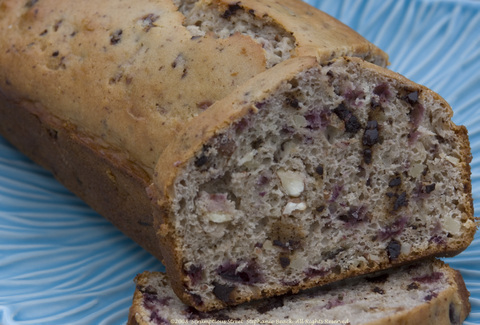 In the cookbook the introduction to this recipe calls them the "energy bar of scones". Indeed. 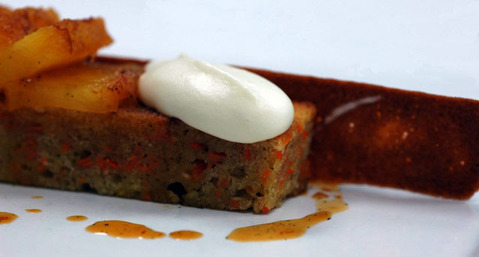 These are fantastic; make them now before fresh apricots are gone. For the past three years, I have been making biscotti nearly every week and am continually on the search to perfect my recipes. Today was a rainy, dreary day in New York and I hadn't made biscotti through the hot July and August months so it was the perfect day. Below is my favorite recipe. I tried at least 50 in my quest for perfection. Now, in my first batch from the new Bosch oven, I am thrilled with the results. Below is my standard recipe, which turned out golden brown, crunchy, hearty and very reminiscent of the wonderful biscotti I've had in Firenze. The reference to Chef's Fingers is a joke -- I always burn my fingers while turning them; thus the need for classic Chef's Fingers. Note: I always make these by hand in a bowl, never using a mixer. I'm sure it would be fine, but I've got my rhythm. Feel free to try this out and let me know how you like the results if you use a mixer. Start by chopping the whole almonds. My favorite tool to do this is an ulu knife and bowl my mother brought me after a trip to Alaska, similar to this. Gently melt the unsalted butter. I use the stovetop, I don't have a microwave. Make sure to watch it so the butter just melts but doesn't clarify. Meanwhile, cream together eggs and sugar with a wooden spoon, stirring completely to make a smooth and runny batter in one bowl. In a separate bowl, sift the flour and add in the baking powder. Mix the two dry ingredients thoroughly. Add the melted butter, aniseed and orange extract to the bowl with the sugar and eggs and stir with the spoon. Slowly add the dry ingredients to the wet ingredients and continue to incorporate thoroughly with the spoon. Do not overbeat. 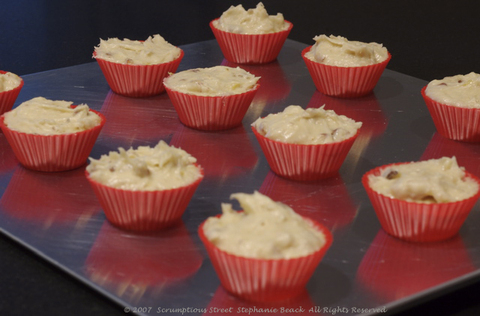 Fold in the chopped almonds and work them into the dough gently. Cover the bowl with plastic wrap and refrigerate between two and three hours. 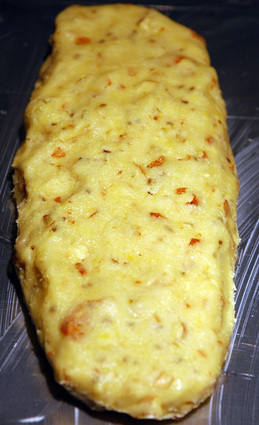 After dough is chilled, begin preheating the oven to 375 degrees Farenheit. Butter two flat baking sheets thouroughly. (By the way, I LOVE these baking sheets.) Divide the dough into two equal parts and form each dough into a large oval, patting down to make it no more than 1 or 1 1/2 inches high, by about 4 inches wide by about 8 inches long. 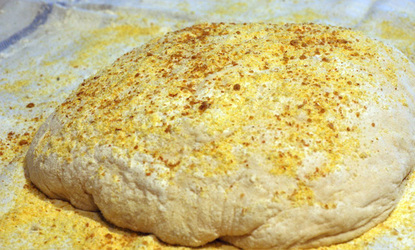 Here's a photo of one of the unbaked doughs. When the oven is preheated, put the dough in and bake until it's a deep golden brown and a toothpick comes out clean. In my oven that was 23 minutes. I usually find 20 -25 minutes is right and have made these in at least 4 ovens. It's always in that time frame. 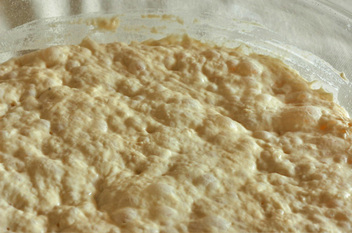 After the first baking, remove the dough from the oven and let them cool slightly. 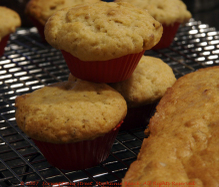 When you can handle them easily, slide them off the baking sheets and onto a cutting board. Using your favorite serrated knife, slice the dough on a diagonal along the dough, making the cuts about 3/4 inch thick; yielding the classic biscotti shape. 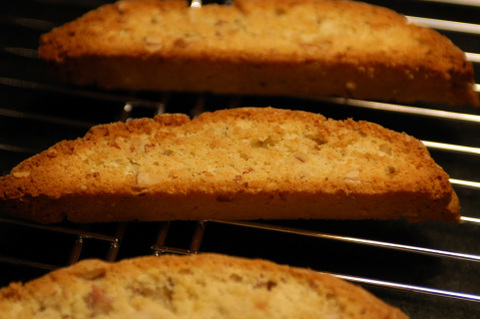 Spread the biscotti out on the baking sheets and return them to the oven, baking 11 minutes. Then, remove them, flip them over (ouch, ouch, get your Chef's Fingers toughened up) and bake on the opposite side for 10 minutes more. Remove them from the oven and let cool completely on a cooling rack. 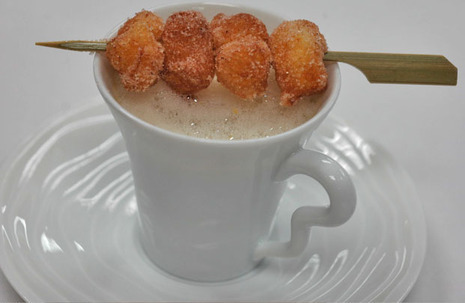 These are definitely a staple in our home and our favorite way to enjoy them is in bed with our morning coffee. 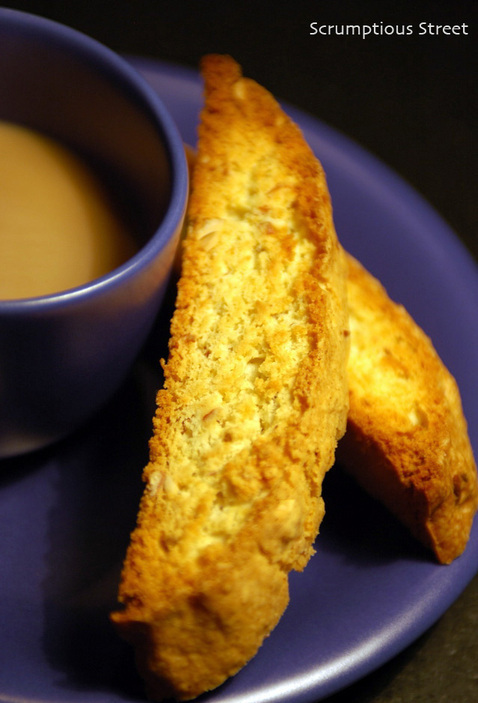 Instead of rushing to start your day, sit up in bed with a steaming cup of strong coffee and dunk the tasty biscotti for a few seconds. The trick is to soften them slightly but not so much that they fall off into the bottom of your cup. Once you start this habit, it's very difficult to stop. Hopefully you will enjoy these as much as we do in our home. BEWARE: this behavior may induce playing "hooky" from your normal daily responsibilities.